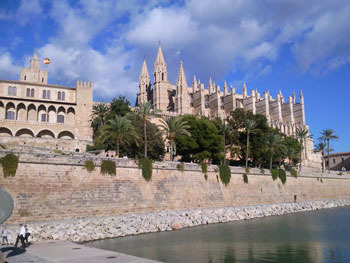 Palma City is the principle town of Majorca and is located on the south west of the island. It has a wonderful old quarter with narrow cobbled streets opening into quaint squares, a huge gothic cathedral, and stunning nineteenth century boulevards. Palma City holidays can be taken from April to October when temperatures rise from twenty degrees to the low thirties. 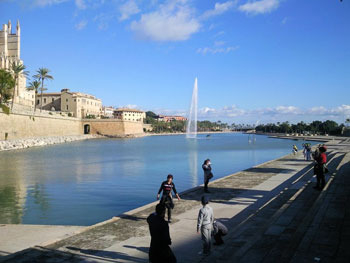 Holidays to Palma City are popular with couples rather than families as the town itself is without a beach. There are of course many wonderful sandy beaches in neighbouring resorts. Holidays in Palma City offer interesting sightseeing opportunities and to make the most of your visit, guided tours are recommended. We have a surprising number of cheap Palma City holidays waiting to whisk you away to sunnier climes. These are considered good value as the standard of accommodation and the quality of the service remain high. With numerous restaurants serving a diverse cuisine and bars, pubs and clubs providing a lively nightlife, our low cost Palma City holidays attract many young singles. If you are looking for a guarantee of sunshine in an historic town with superb shopping you may be tempted by our Palma City holiday offers which won't break the bank. For further information and to discover our best Palma City holiday deals, please use the search facility.